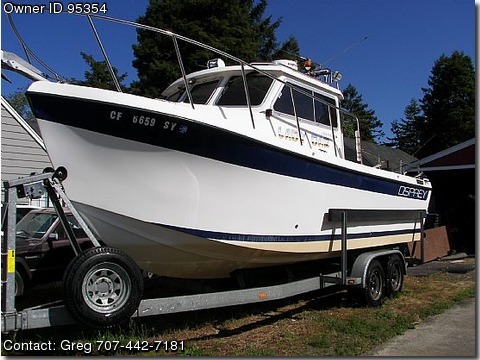 Call Boat Owner Greg 707-442-7181.the price is $49,900.00 obo. two new cannon down riggers. 1200 lb. 12 volt crab block.hot and cold psi water in sink. 12 volt /110 volt refrigerator force air heating, surround sound stereo on back deck also. marine head with holding tank and selector valve for pump out. blue led rope lighting on back deck closed water system. bravo three duel prop out drive,galv. trailer with disc brakes (duel station controls)... duel vhf. the motor was redone,and balanced... at wally,s engine shop, all parts that where not perfect where replace. to much to list ..